Fire on the mountain, a photo by The Bacher Family on Flickr. In late September, western Washington suffered under smoke from forest fires around Mount Adams and Ellensburg. One side effect was spectacular sunsets and sunrises as the light diffused through the particulates in the air. 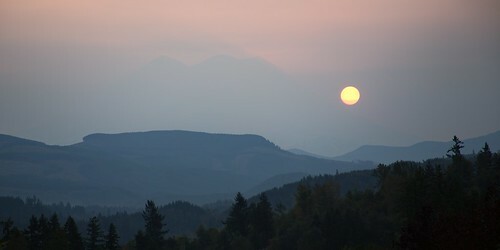 This is a sunrise from our home in Eatonville, looking out over the foothills toward Mount Rainier. I cropped it as if it were a panorama shot; in reality, it just removes the street lamps and RVs in the foreground!